Related to the website or Armchair Arcade itself. 1 - If you want to comment about an editorial or article, it's best to do so directly with that editorial or article, rather than in the forums. 2 - In keeping with the professional atmosphere, try to keep the language clean. Giving what you write a quick proofread and following the basic rules of the English language will also be appreciated by all! 3 - If you're going to argue with someone, don't make it personal. Armchair Arcade Marks its 10th Anniversary! 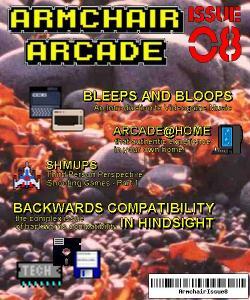 It is with great honor and humble appreciation that I write this blog post officially acknowledging Armchair Arcade's 10th anniversary. That's right, Armchair Arcade was founded way back in September 2003, an eon in Internet time. Little did we know when we founded it back then that we'd still be going strong 10 years later, and looking forward to another great decade ahead. Since Armchair Arcade's founding, our team members have created well over a dozen major books, a documentary film, and countless thousands of feature articles, blog posts, forum posts, editorials, games, podcasts, and videos. Of course, team members and friends have come and gone in those 10 years, and we've even had a few births along the way, but the more things have changed, the nicer it's been that Armchair Arcade itself has stayed right where you'd expect to find it. Pebble Armchair Arcade FacePaul, aka @prode81 on Twitter, has made available one of the first Pebble watch apps, a nifty Web browser-based watch face generator. The link is here, and it's a simple, but great way to experiment with your own Pebble watch without knowing a lick of programming. Check the image below to see how the Armchair Arcade watch face turned out, plus you can scan the QR code with your phone to put it on your own Pebble. If you like Paul's work, don't forget to donate! Hi, folks. I thought that today, in the spirit of the "top" lists that are so ubiquitous these days, I'd offer you a list of five reasons why you should care about Armchair Arcade. Many of you may not even know what it is or how it got started, but even those of us who've been around since the early days might like a little refresher and a personal view. So, here goes. Reason #5: Founded in 2003. That's right, folks, Armchair Arcade has been around for eight years. Actually, its birthday is in September. There's not many non-commercial websites that can make that claim, especially not many dedicated to vintage games and computers. You should feel comfortable making this your home base, because you can rest assured we are here to stay. You can read our about us page or our FAQ to learn more. Armchair Arcade Featured in Southwest Airlines Spirit Magazine! For all you frequent fliers out there, you might have noticed an article in the March 2011 issue of Southwest Airlines Spirit Magazine entitled, Play it Again, Man!. It was written several months back (thank you, print lead time) by Jennifer Nalewicki under advisement from yours truly and my frequent partner-in-crime, Matt Barton. 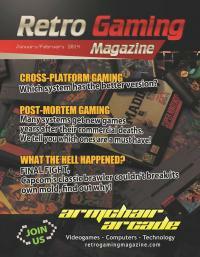 Besides mentioning us and Armchair Arcade, you'll also see a nod to our book, Vintage Games, in the header. While it's not a long piece, it's nice to see something targeted to mainstream audiences like Spirit Magazine is featuring positive videogame content. Check out the print version on your next Southwest Airlines flight or click here for the PDF or here for the decidedly less fun text-only version. As we enter our ninth calendar year of operations here at Armchair Arcade, I just wanted to take a moment on behalf of the entire team to wish everyone out there a happy, healthy, and successful 2011, and reflect on what has come and what will come around here. A lot has happened since Armchair Arcade's founding in 2003, some bad of course, but most of it very, very good. We released a year and a half worth of original Webzines before moving exclusively to an available-content-right-after-it's-created blog format, which began in October 2004. We've produced four major books to date, with the promise of more on the way. We've been in production on a major feature film documentary since 2009, which we expect to finish and release this year. We've been producing popular Web videos since 2004. And of course we recently entered the podcasting arena with our eclectic Armchair Arcade Radio, which is already onto its sixth episode. Though that's just the tip of the ongoing saga that has been Armchair Arcade, it's something I'm quite proud of and quite thankful to have you along for the ride after so many others have come, gone and even come and gone again (and again). Anything new you'd like to see us tackle in 2011? Have other ideas? Have some feedback? Let us know in the comments. We always love when you make some noise out there!